How and where does youth work discuss outcomes vs outputs? 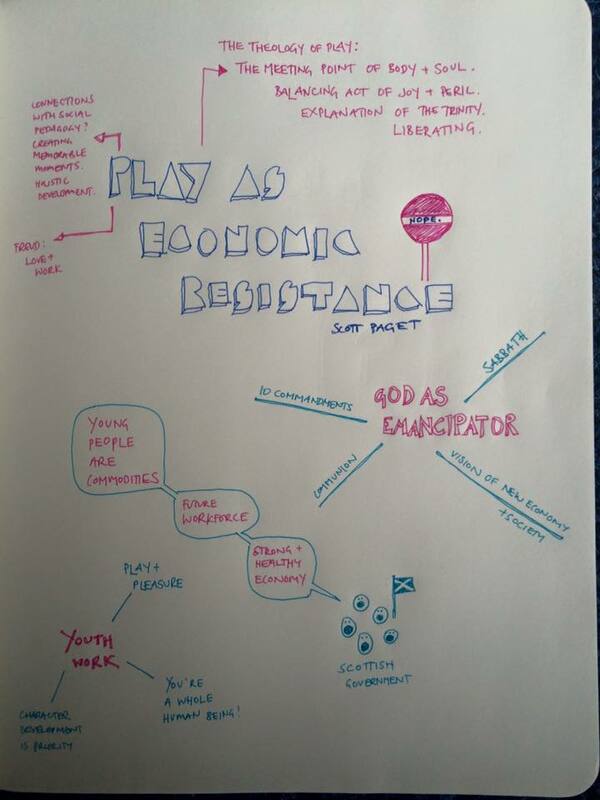 – resistance – is youth work selling young people? – how do we judge what is a successful life for the young people we work with? 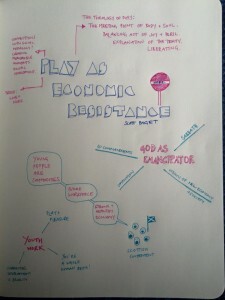 – economic view of young people contrasts with a life of purpose and fulfilment. — How do we teach to young people, when the two agendas seem at odds? — Within youth work what change do we want? Could Social Pedagogy be a fruitful avenue for investigation? Play can be misread as hedonism, buying out of the system, which is ultimately a hollow experience. What is the difference between productivity and commodification? Viewing young people with instrumental value vs viewing young people with intrinsic value. Bringing back sabbath and eucharist to youth work. Are there Post Christendom readings of the book of Romans that feeds into the topic. Do we try to supply a fully formed theology when actually young people live with a fractured, unsystematic theology? How self-perpetuating is youth ministry, as young people become too old to come as young people they move to planning groups to ensure the event stays true to their memory? (youth ministry as tradition reinforcement). How do we encourage change in young people’s christian faith experience? How much youth work is dealing with the issues of the parents & community? Who are the invisible young people within my context. Where could I learn to see or work with them? The ethics of praying for young people and issues of their consent? How do we tell a good story without controlling it? How do we ask good questions without controlling the question? Ask volunteers to physically picture what play looks like. Criticism of Youth Ministry by Christian Youth Work helps to clarifying the difference between the two approaches. – can this be heard by Youth Ministry or is it too close for comfort? – does faith need defending? has faith ever been helped by an attack/defence apologetics conversation? Digitally native needs to be assumed as digitally naive. (just because the stuff is there does not mean we know how to use it well.) Who teaches us this skill or are we left to our own devices, literally?